The Chinese companies produce not only smartphones and tablets, but also many different laptops. 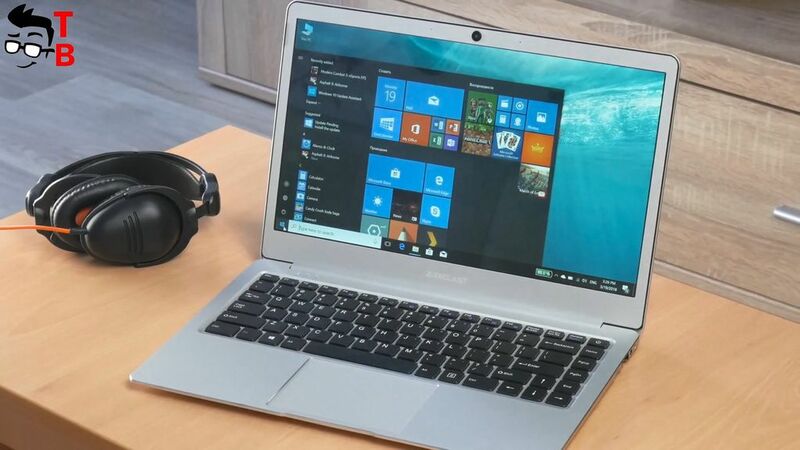 We already reviewed some tablets from Teclast, but today we want to talk about laptop, or even ultrabook. 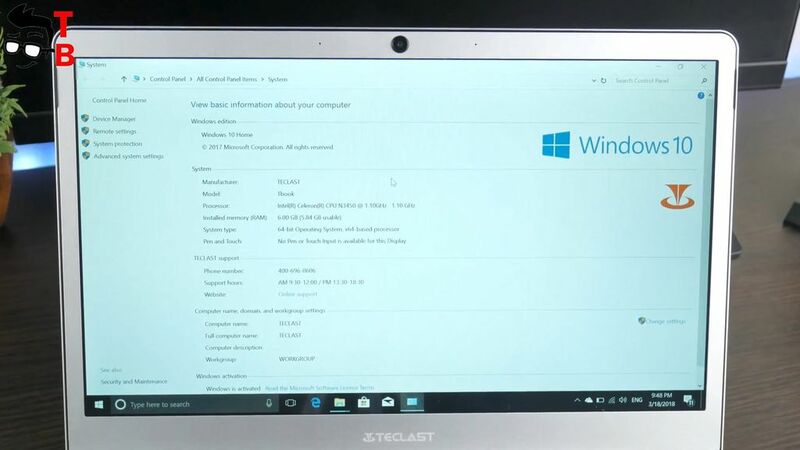 Teclast F7 has 14-inch Full HD Display, 6GB of RAM and 64GB of storage, Intel Celeron N3450 processor, and Windows 10 operating system. Moreover, its price is about $320, just like mid-range phone. 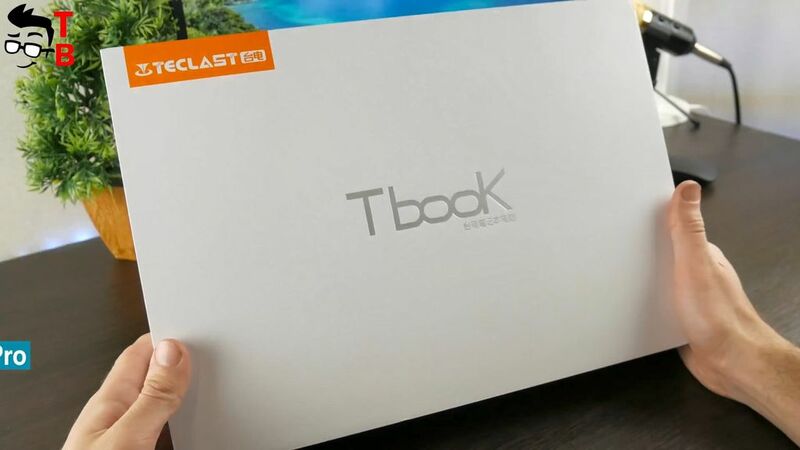 So, let’s make unboxing and review of Teclast F7, and find out can you use it as your daily laptop for working, playing and entertainment. 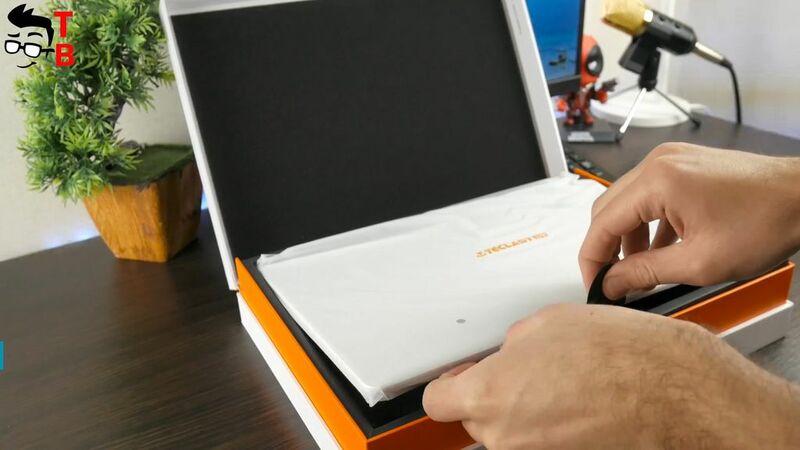 The laptop comes in a white box. 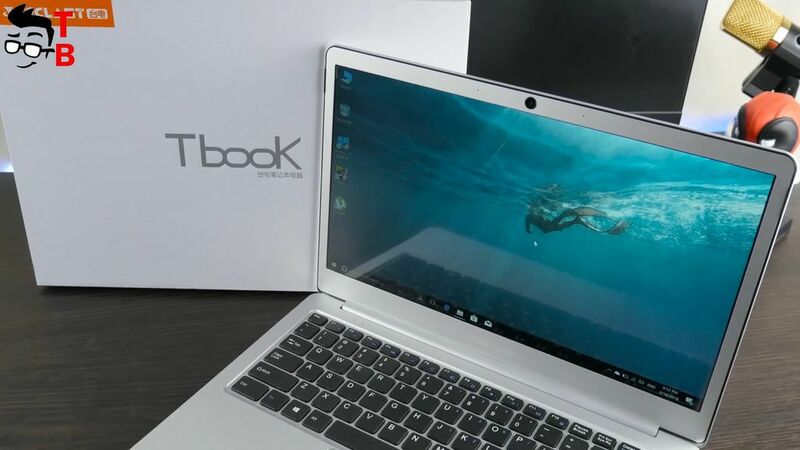 Here you can see company logo in the left corner, and series TBook in the center of the front panel. 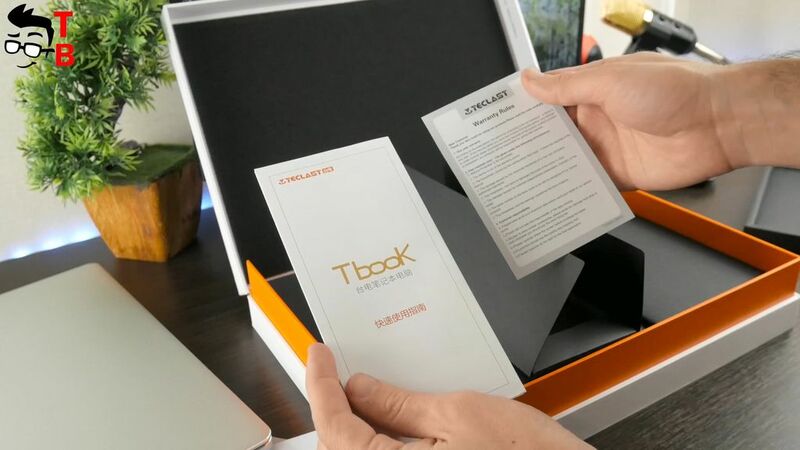 The first impression is that the box is really solid and reliable. It will ensure the safety of the laptop during transportation. Inside the box there is a laptop in transport package. There is a sticker here to get the laptop out of the box. It seems that manufacturer took care of all details. Also you can find an envelope with documentation such as warranty and user manual. Under it there is power adapter with 12V/2A. That’s all! Nothing else you will find in the box. 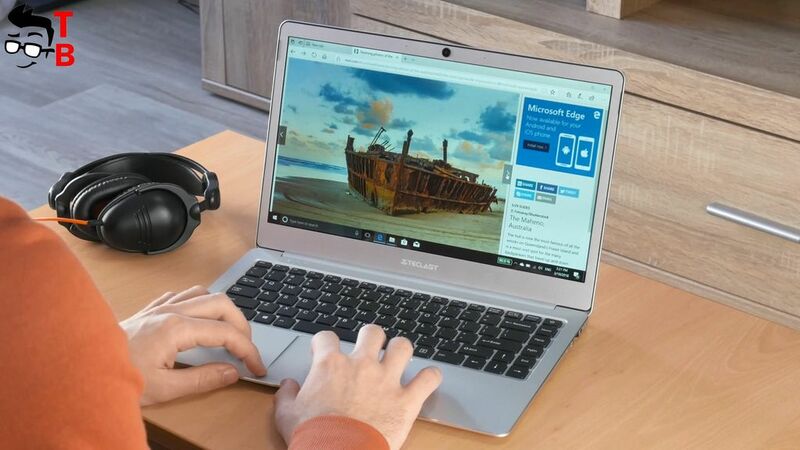 Yes, the laptop is not the smartphone, so you will not get many different accessories. 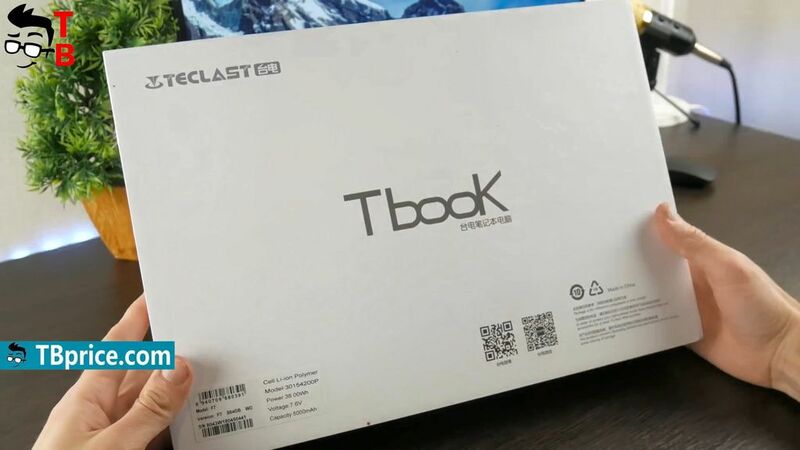 Now, let’s look at design of Teclast F7. The laptop is very lightweight – about 1 kilo and 200 grams, and compact enough. The maximum thickness is about 14mm, while the minimum thickness is 11.4 mm. 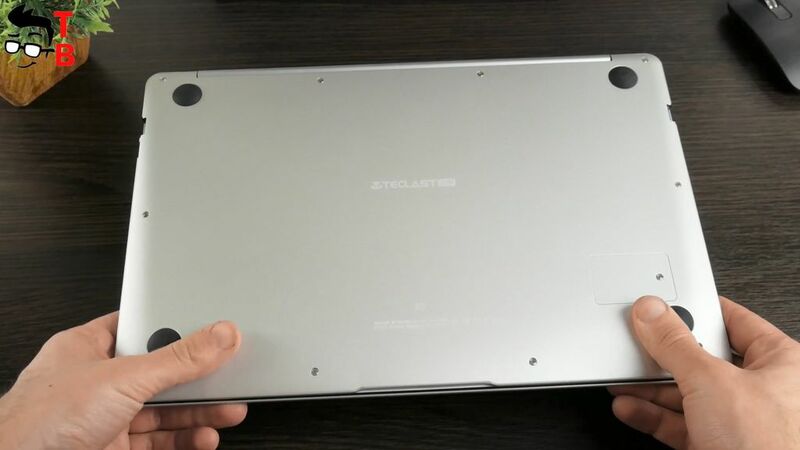 Teclast F7 is made of metal with rubber stands at the bottom. The front panel is very clear. There is no company logo or other inscriptions. As for the back side, as I already said, there is rubber stands, and screws to open the case of laptop. 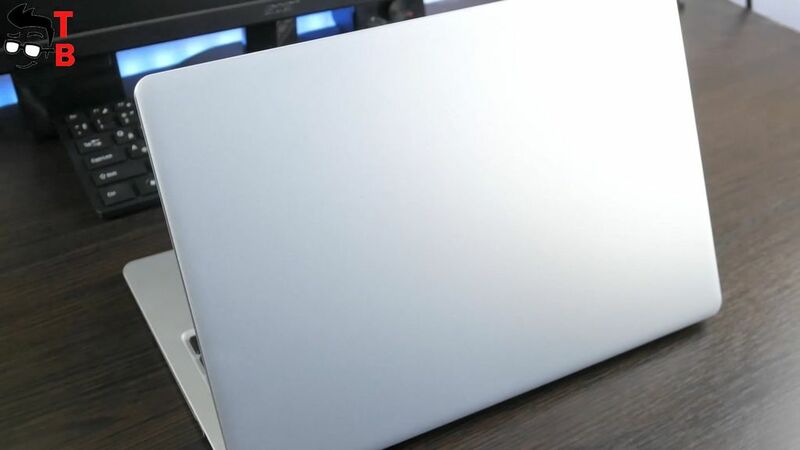 There are no ventilation holes or something else, because Teclast F7 is fanless laptop. 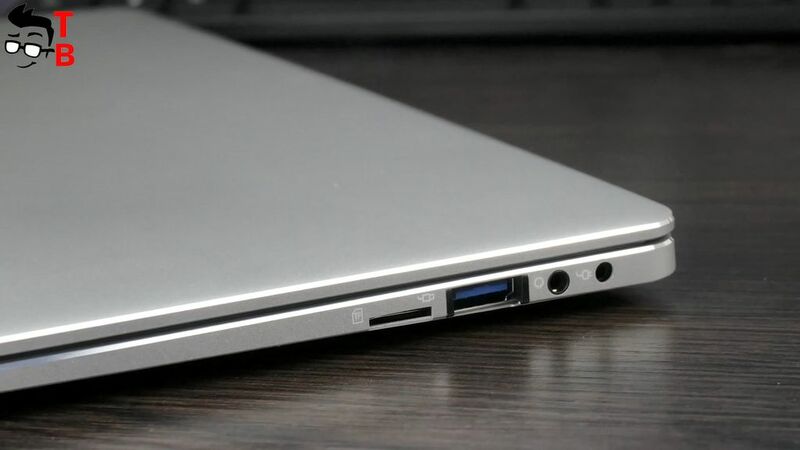 On the right side you can see slot for microSD memory cards, USB 3.0 port, 3.5 mm audio jack, and DC port for charging. 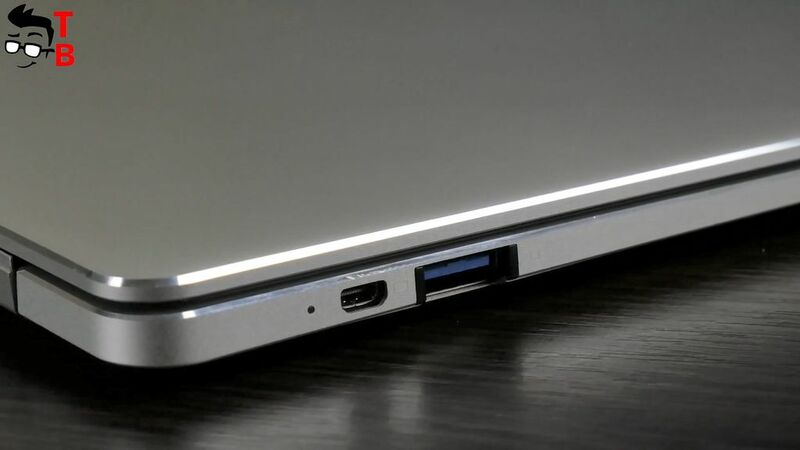 The left side has HDMI port, and the second USB 3.0 port. Now, let’s make the first and one of the main test for laptops. I will try to open the laptop with one hand. As you can see, it is impossible to do. You need to hold the bottom with your second hand, and the open the screen. 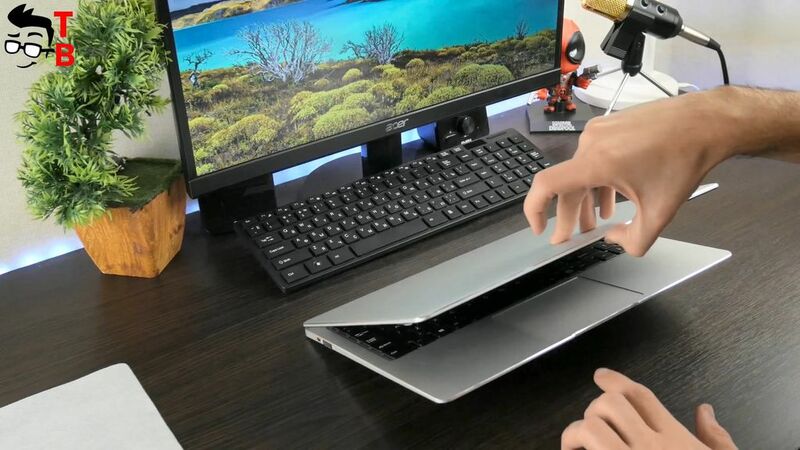 I am not surprised, because only expensive laptops are opened with one hand, such as MacBook or Xiaomi Notebook Pro. 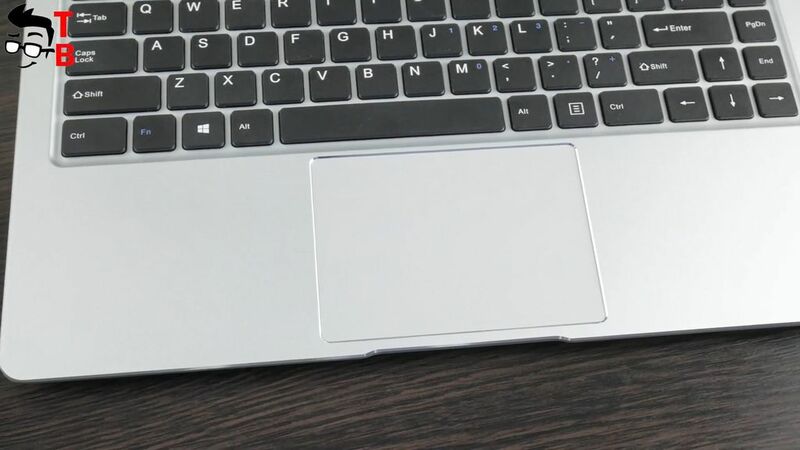 Another big disadvantage of Teclast F7 is the screen mount. Just look at it! The screen shakes very much, like a jelly. 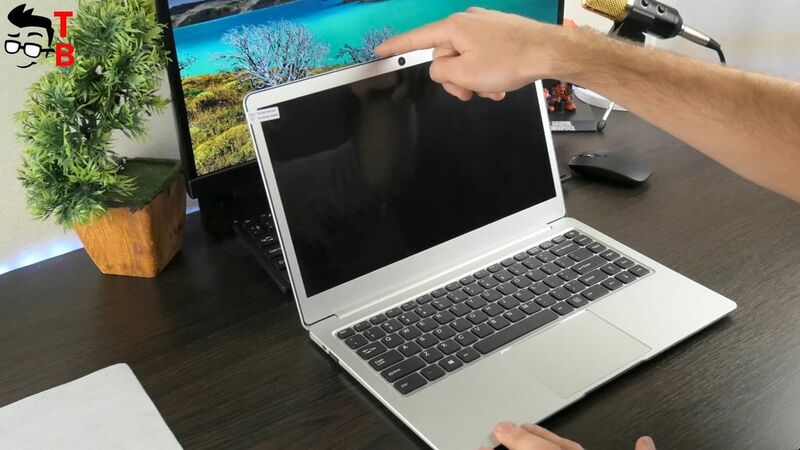 I do not think it will be a big problem, but it makes the laptop looks very cheap. The screen has bezels about 12 mm. 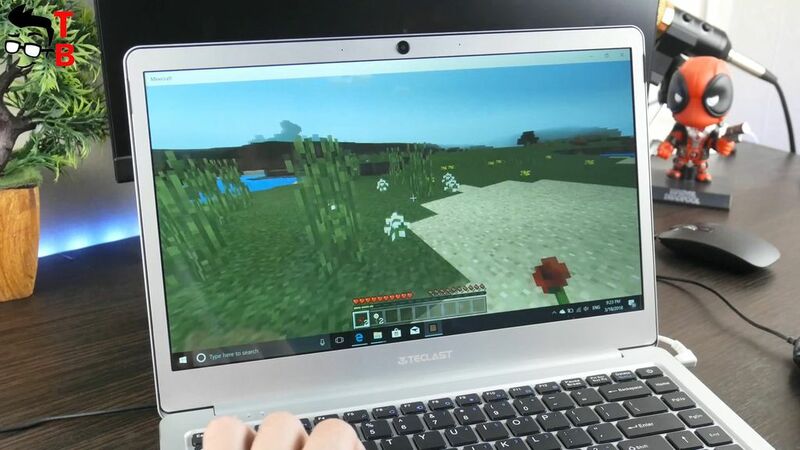 It is pretty good for budget laptop. In addition, there is the front camera, and two stereo microphones at the top of the screen. 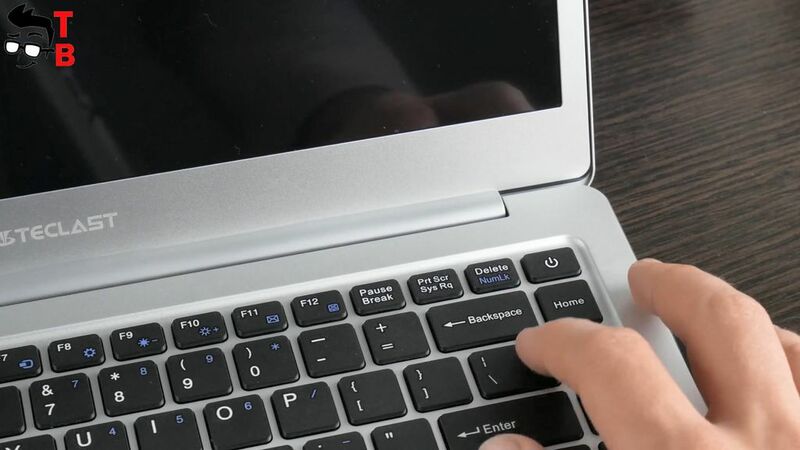 The first thing I really like in this laptop is keyboard. 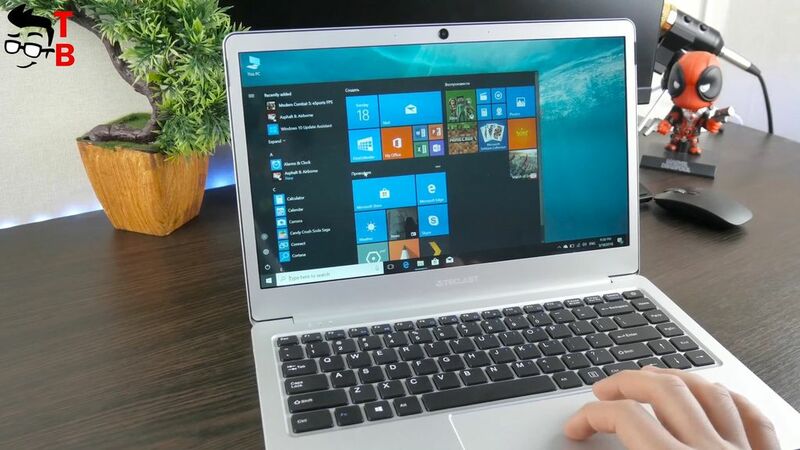 It is the same layout as Xiaomi Mi Notebook Pro, and in general, it looks and feels very similar to it. There is a special keys on the right side with home, page up, page down. The keys are pretty big, and they have a good feedback. 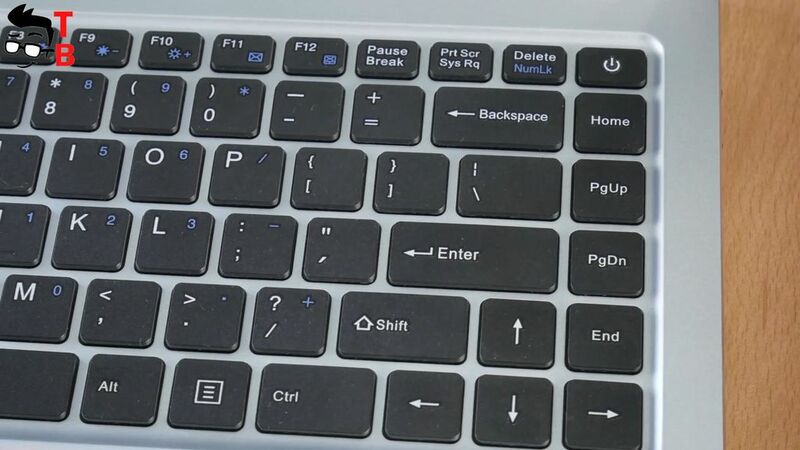 The only problem is that Delete button is located very close to Power key. I accidentally pressed the power off key instead of DELETE. It is a bit annoying. The touchpad is pretty big. 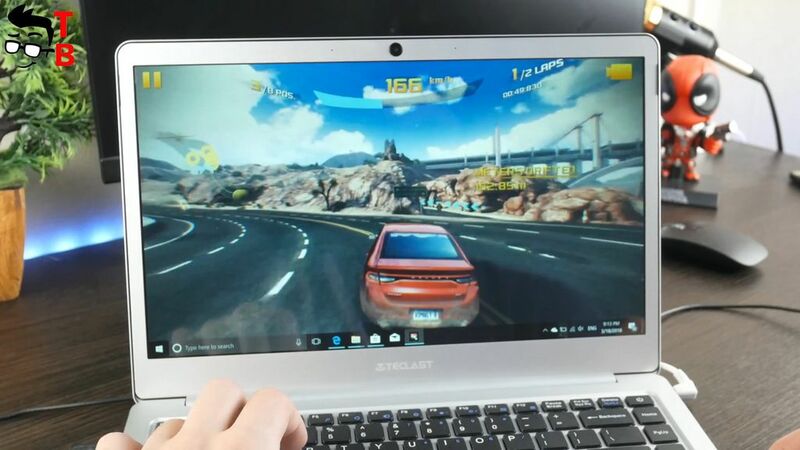 There is support for different gestures using special Windows drivers. Also, it has right and left buttons, just like the mouse. By the way, the speaker in located between the screen and keyboard. To be honest, first, I could not find the speaker, and it is really small and well hidden. Later we will test the sound from built-in speaker. As for the display, the situation is very strange. 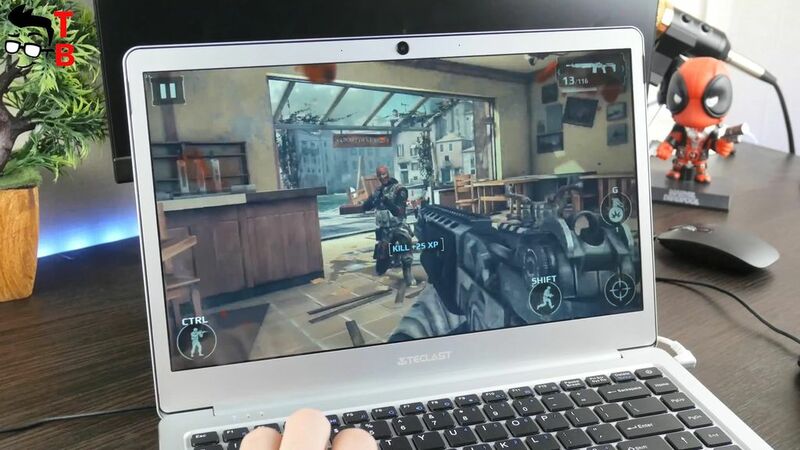 Teclast F7 has 14-inch screen with Full HD resolution. Also it is IPS panel, that is very good. However, I don’t know why it is so warm. 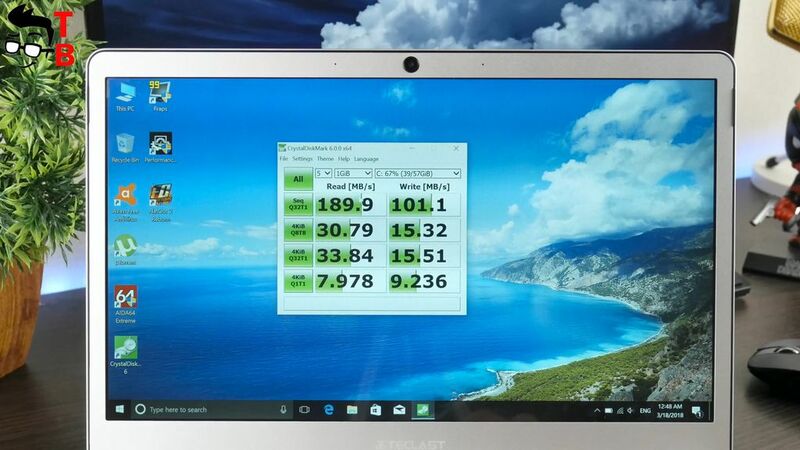 Compared to other laptops, Teclast F7 screen has very warm image. Also, if you reduce the brightness, you can notice flickers. Of course, you cannot see them in real life, but the my camera captures them. 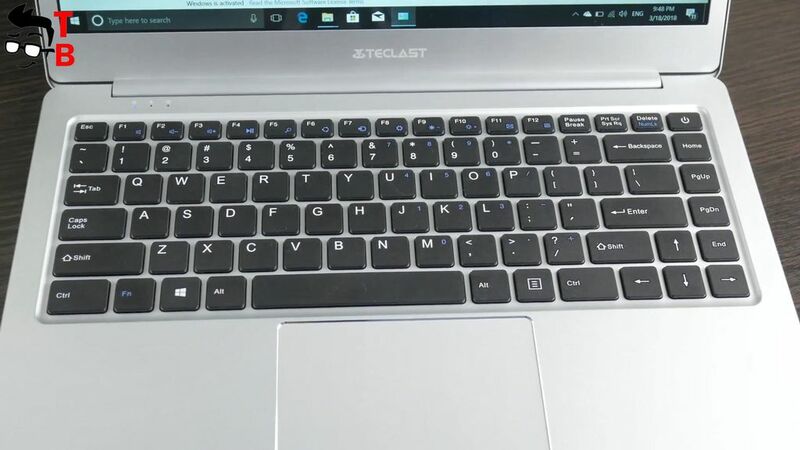 I do not know what the problem is and how it affects the user, but I want to say that my eyes are tired after testing this laptop. In general, the display is well detailed and bright. Also, it has good viewing angles. By the way, the maximum brightness of 190 lux. This is enough for using the laptop even outdoors. 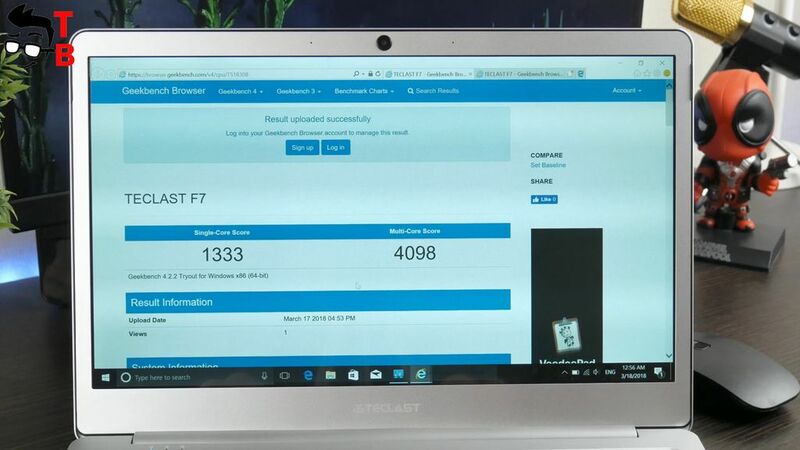 As for the hardware, I cannot say that Teclast F7 is super powerful laptop. I tried to launch some latest games, such as Forza Horizon 3, however it says the graphics card and system memory doesn’t meet the minimum requirements. From the other hand, I don’t notice any problems with every tasks, surfing internet, watching videos on YouTube and others. 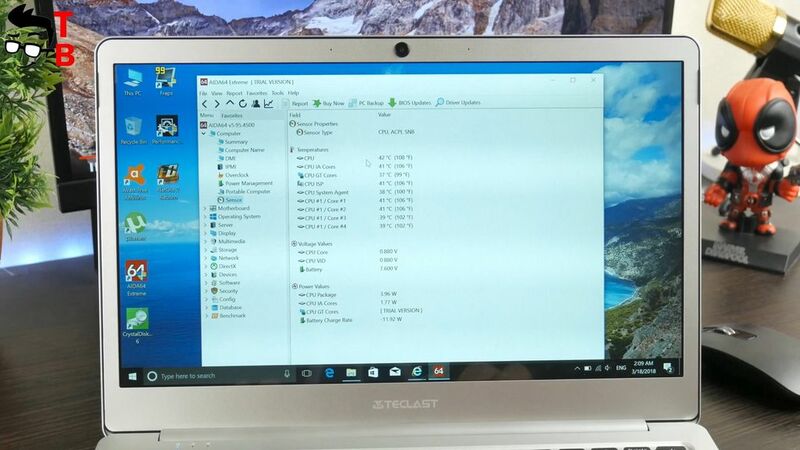 Teclast F7 is powered by Intel Celeron N3450 Quad Core processor with maximum clock speed up to 2.2GHz. Also there is Intel HD Graphics 500 GPU. 6GB of RAM provides good multitasking, while 64GB of internal memory is not enough for modern laptop. Fortunately, it supports SSD expansion. Let’s start our performance test with memory speed. CrystalDiskMark shows about 190 MB/s reading speed and 100 MB/s of writing speed. It is very low for laptop. Now I understand why the latest games doesn’t run on it. For example, Xiaomi has 3400 MB/s reading speed and 1200 MB/s writing speed. As you can see, the difference is significant. 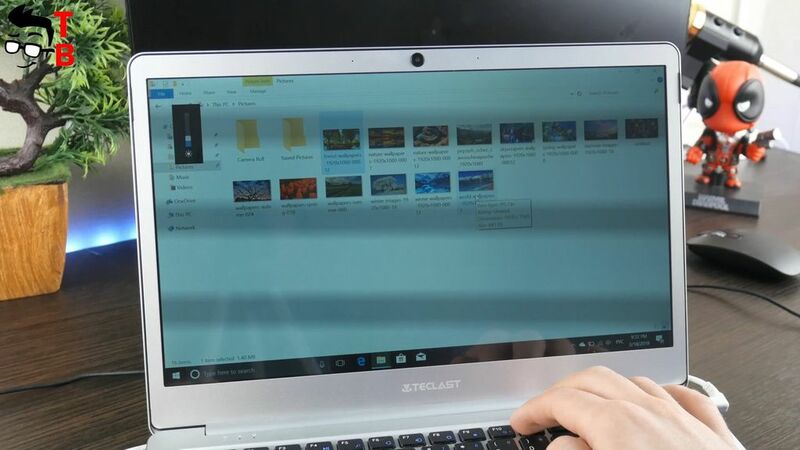 If you are planning to use this laptop as your main working device, then it is better to replace the built-in eMMC memory on SSD drive. As for GeekBench, it shows 1333 points in single core test and 4100 points in multi core test. The OpenGL score is about 8100 points. These are expected results for integrated GPU. CineBench R15 shows the following results: 12 fps in OpenGL test, and 159cb in CPU test. 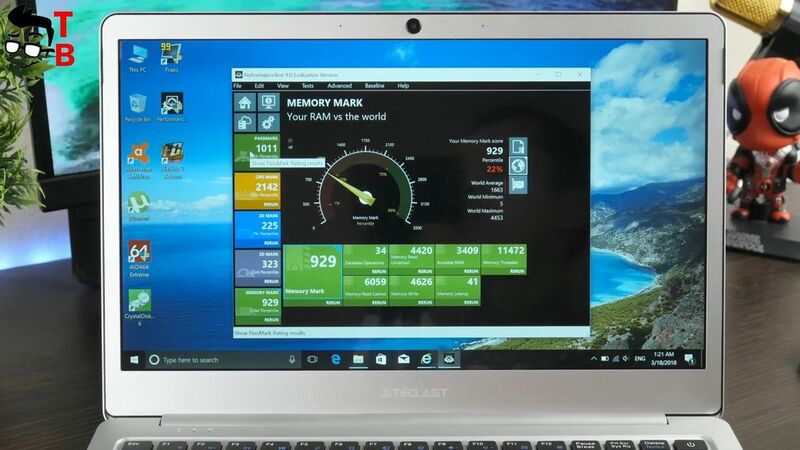 Also I want to test this laptop with application called Performance Test 9.0. 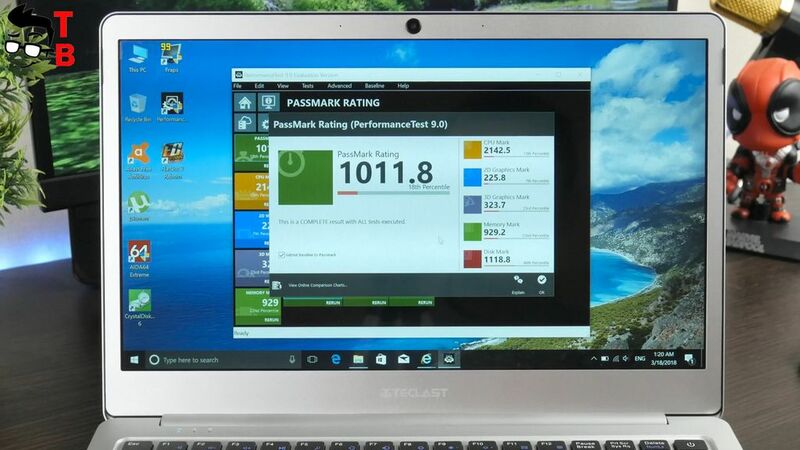 The pass mark rating shows that Teclast F7 is far from the best laptop against the other devices in the world. It is not even average – about 1011 points, while the average result is 2400 points. Almost the same results in more detailed tests, such as CPU, GPU and memory. By the way, 3D graphics result is the worse, about 323 scores, while the average result for laptop is 3033. From the other side, the memory mark is pretty good – 929 scores. It says that RAM is good in this laptop. The average temperature of laptop is about 40 degrees. 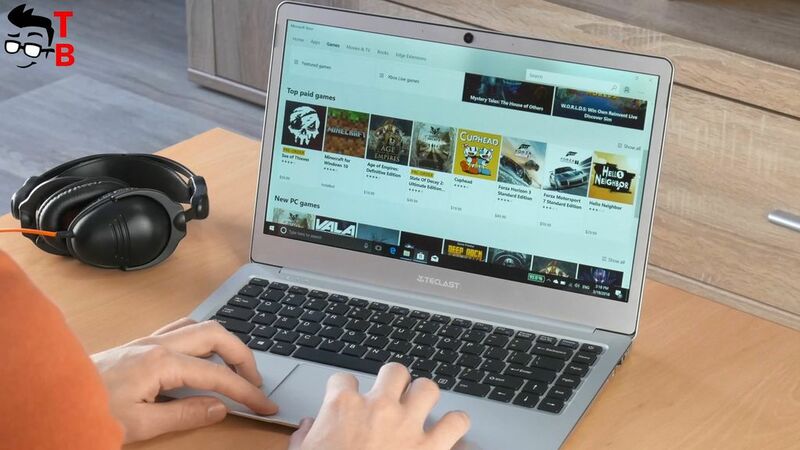 It is really good for budget laptop. Also, I want to watch 4K video on YouTube. 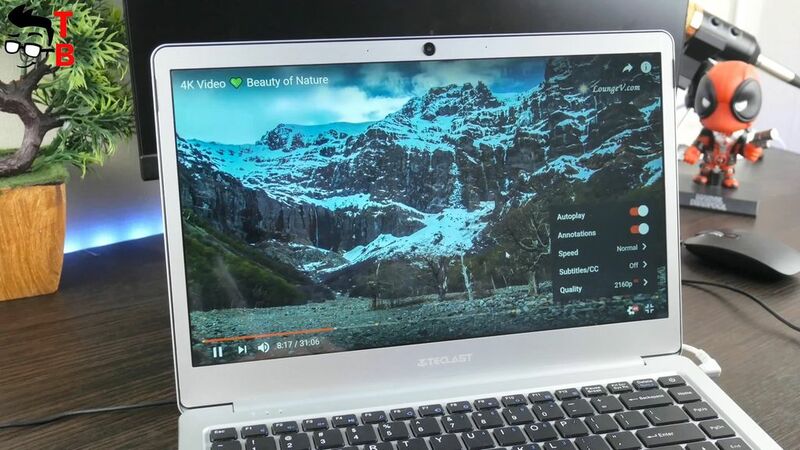 As you can see, Teclast F7 plays the video pretty smooth. I do not see any kind of delays. Now I suggest you to watch some games, that I was able to run. Now I want to test the sound from built-in speaker. As I already said, the speaker is hided between the screen and keyboard. Actually, you cannot see the speaker, only hear. However, the sound is pretty loud. 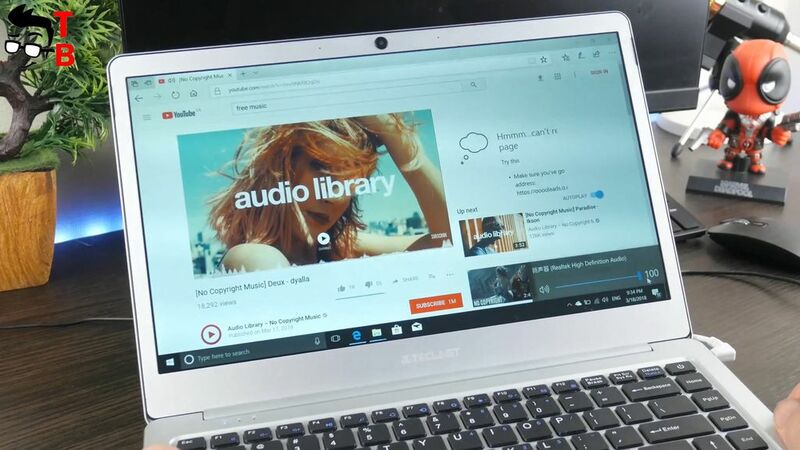 Of course, there is a lack of bass, especially compared to Xiaomi Mi Notebook Pro, but it is possible to use for watching videos on YouTube or even movies. 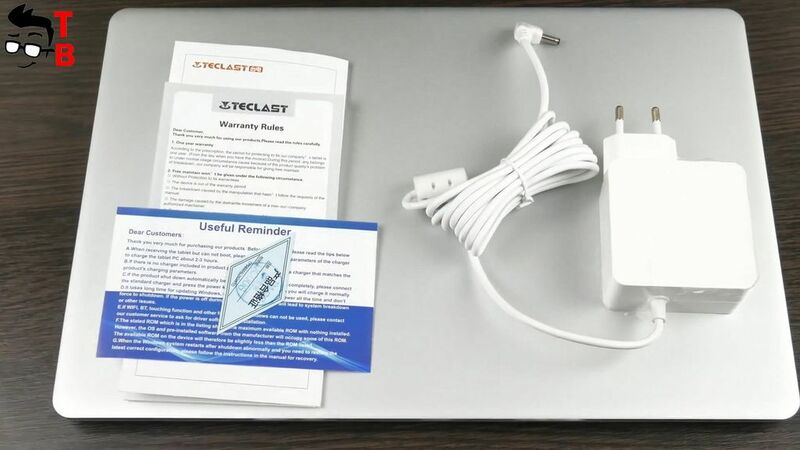 Teclast F7 is equipped with 4500mAh battery with 7.6V. I tested the battery with playback movies at maximum brightness with turned on Wi-Fi. So, the laptop worked about 4 and a half hours. 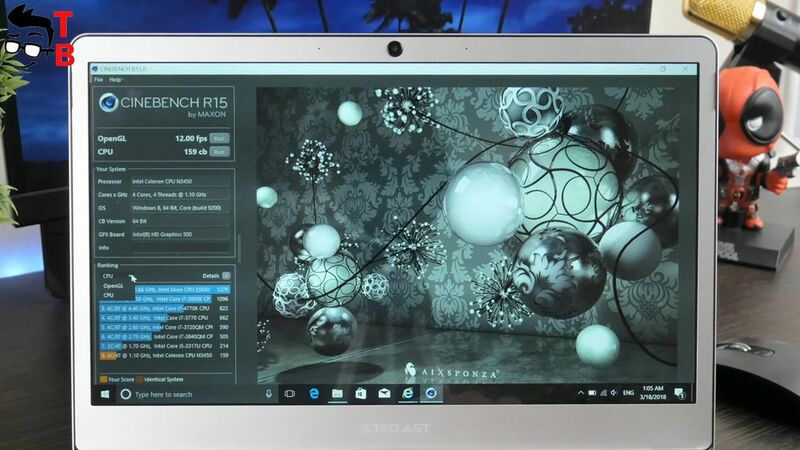 I am not sure that it is the best result, but it is pretty good for budget laptop. 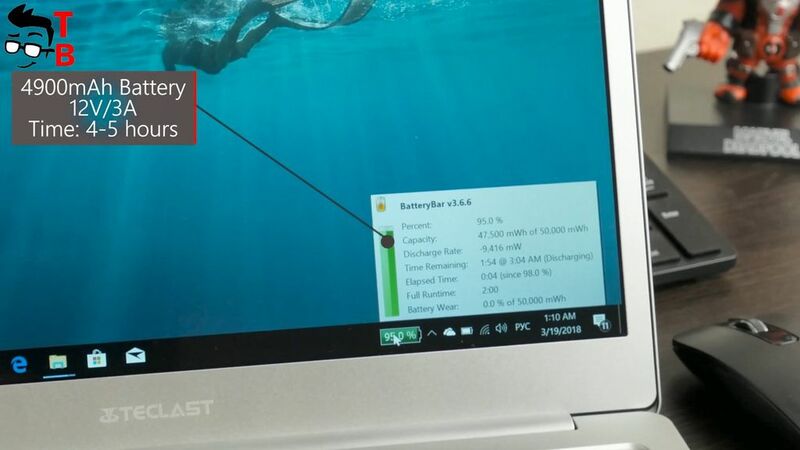 You can count on about 6-7 hours of battery life on a single charge with mixed using, such as surfing internet, watching videos, working with documents, etc. So, I have mixed impressions from Teclast F7. 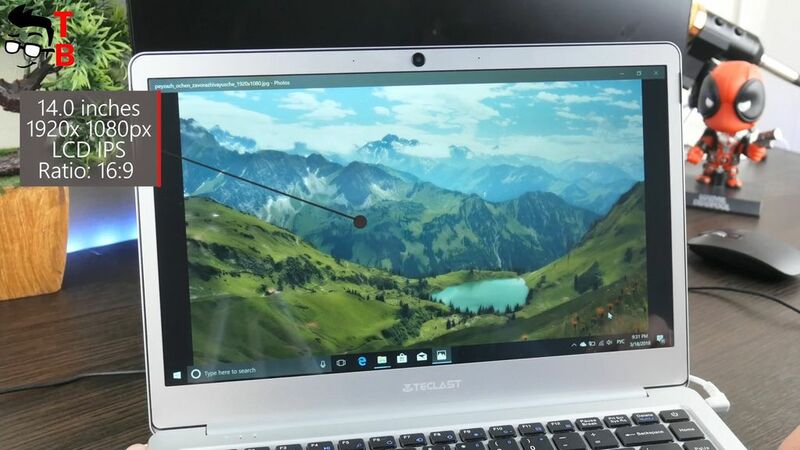 Right now I am using Xiaomi Mi Notebook Pro as my daily laptop, and it was not easy to test Teclast F7, because it has some big disadvantages. 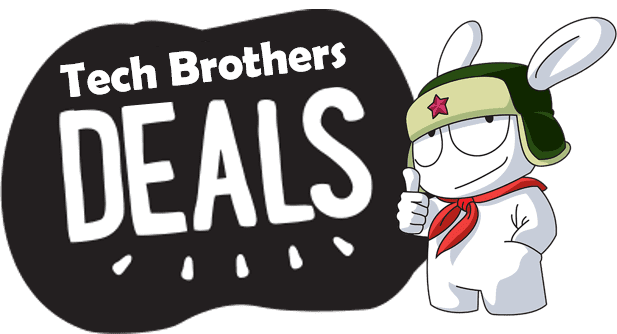 Of course, I understand that the price is very different between Teclast F7 and Xiaomi Mi Notebook Pro, and these laptops are from different categories, however, many people are planning to buy Teclast F7 as daily laptop, so they want to know truth about it. First, Teclast F7 has good built quality and thin metal body. The design is clear, simple and minimal, and I really like it. From the other hand, the screen shakes, and it is annoying. 14-inch IPS display is very good. It has decent contrast, details and brightness. 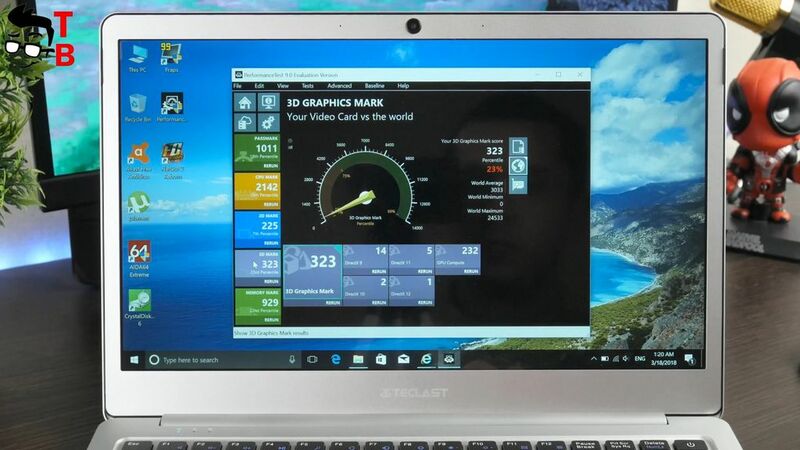 As for the hardware, benchmarks show that it is weak laptop for playing games or photo/video editing. And it is true, I cannot run latest Windows games. Also, eMMC memory is slow, and I would recommend to install SSD. However, I don’t notice any problems with performance while surfing internet, playing movies, working with documents. 6GB of RAM provides pretty good multitasking. In other works, Teclast F7 is good office laptop. Also, I don’t have any complaints about sound and battery. They correspond to the price of a laptop. Nomu M6 First Review: Slim Rugged Phone? IT'S REAL!